Bali (Μπαλί) is a coastal resort on the north coast, approximately 33 kilometers east of Rethymnon. The village of Bali is located at the head of Bali Bay and is set around a series of small coves. Its setting is very picturesque. There are four beaches around Bali Bay comprised of either fine sand or pebbles. All the beaches are sheltered from the 'meltemia' winds which can affect some north coast beaches in the summer. Accommodation and food and drink facilities are available. The beaches are excellent for swimming, water sports and well equipped for sun bathing. Paradise Beach is considered to be the best for swimming. 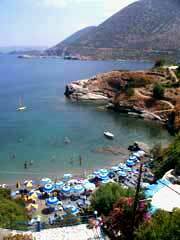 Livadi Beach and Varkotopos Beach both have Blue Flag awards. Two of the small coves on the west side of the bay offer sheltered mooring for small boats and yachts during the summer months, with the exception of the north eastern winds. The anchorages are less safe during the winter. Easily accessible from the National Highway (1 km). A regular bus service runs between Rethymno and Heraklion which stops at the edge of Bali. By car the resort is a 40 minute drive from Rethymno.